If you’re familiar with “Oh Crap!” you may have heard about the “red solo cup” potty training trick. It took me a while to figure out how to make this trick useful for potty training, but I’m glad I did. It’s saved the day quite a few times for me! In our house, we don’t use the standard “red solo cup” that many of us are familiar with. 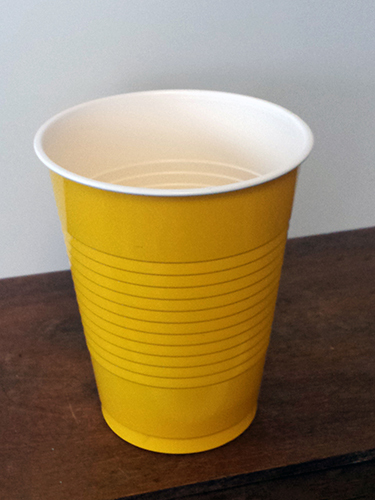 Instead, we just *happened* to have on hand – PERFECT potty training color – YELLOW solo cups! Today, I’d like to share my top situations in which the solo cup – of whatever color - can be a great tool in potty training. In those early days of potty training, you may not have a lot of warning before the pee starts to come. Having an easily portable “parent approved” container in which to catch the pee can really help if you can’t get your child to the potty. see the solo cup in my hand and sit right down on the potty! Bath time. That relaxing, warm water in the bathtub can create the feeling to pee. You may have experienced this yourself! 🙂 It can be a lot of work to get out of the tub, dry off, and get to the potty. MUCH easier: hold a cup up for them to pee in! Bonus: When you get to a point where your child has to pee in a cup at the doc, they will already be a pro! Bottom line: Using a cup for tricky potty training situations can feel weird to us as parents, but don’t underestimate the power of this handy, cheap tool! Definitely tougher for girls (I have one too!) but does still work! This is interesting. I’ve never heard of the solo cup idea. Does this work for boys as well?? I can only see pee going everywhere with something that small to pee into! Yes – definitely works with boys! It’s not a long-term solution but helpful to get through those tough moments! This is a really great idea! Bath time is always the hardest for us, so I am going to introduce this idea!